It is not necessary the use a lifting device to remove and replace the starter motor on this vehicle. A memory keeper device should be inserted in the cigar socket to retain the original computer settings. Using a 10mm nut driver or 1/4-inch 10mm square drive socket and 1/4-inch square drive ratchet, remove the nuts that secures the top engine cover. Release the clamp on the back of the cover that secures the hose to the EGR valve. Using a 10mm nut driver or combination wrench, remove the cable to the negative and positive terminals of the battery. Remove the bolt that secures the battery hold down bracket. Arcing caused by a wrench, can fry an expensive electronic component. Remove the negative cable first followed by the positive cable before removing the battery. When installing the battery, install the positive cable first followed by the negative cable. Remove the bolts securing the battery tray to the body. Remove the battery tray. 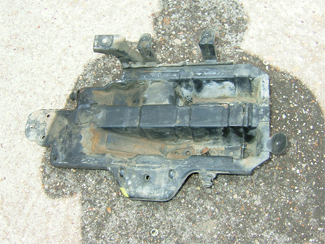 Figure 2-1 shows the tray being removed from the vehicle. 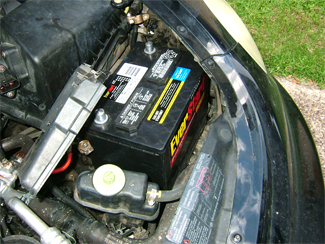 Figure 2-2 shows the battery tray removed. Using a creeper on wheels remove the two (2) bolts underneath the vehicle that secures the starter motor to the engine block. An 18mm 3/8-inch square drive socket and a 3/8-inch square drive ratchet is required for removal of the starter motor. 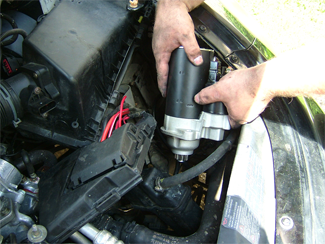 Figure 2-3 shows the starter motor being removed top-side from the Bettle TDI. Electrical tests showed that the starter motor was defective. To confirm the diagnosis, it was bench tested using a battery booster pack and jumper wire. Figure 2-4 shows the starter motor being bench tested. 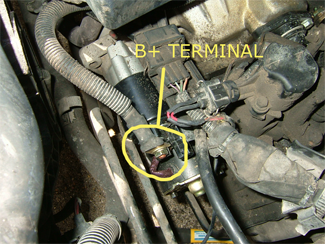 The red cable of the starter pack is connected to the B+ terminal of the starter motor. 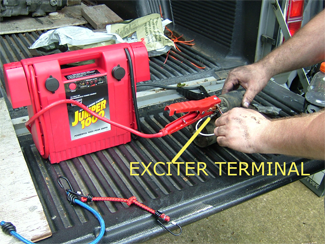 One (1) lead of the jumper wire is connected to the starter motor low-voltage exciter terminal. The other lead is touched to the starter motor B+ terminal. If the starter motor is good, the solenoid will lift and energize the pinion and ring gear. It spins at roughly 150 to 200-rpm’s. The starter motor that the TDI Guy removed from the Bettle TDI was defective. Two tests should be made (no load and load) to check the full condition of the starter motor. The above test is termed a no-load test. It is tested on the bench out of the vehicle. The second test is a load test that is made with the starter motor installed in the vehicle. Both tests require the battery starting pack. The battery posts, battery cables, and starter motor terminal wires were coated with corrosion. They were thoroughly cleaned with a battery post cleaning brush and sand paper. They were then coated with Vaseline for corrosion protection. 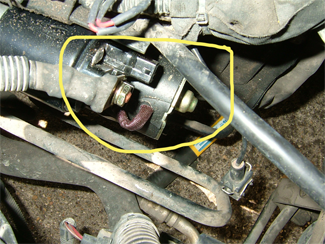 Figure 2-5 shows wires that connect to the starter motor are corroded. 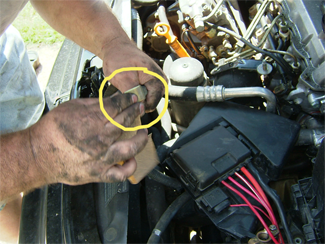 Figure 2-6 shows the starter motor negative cable being cleaned with sand paper. 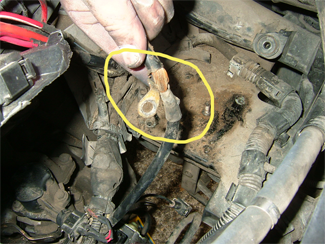 Figure 2-7 shows the B+ cable installed on the replacement starter motor. Figure 2-8 shows the replacement starter motor installed in the Bettle TDI. 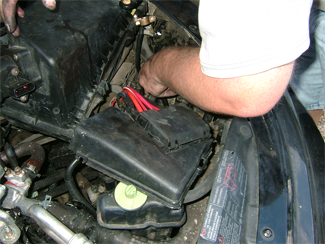 Install the starter motor and cranking battery in the same order that they were removed. 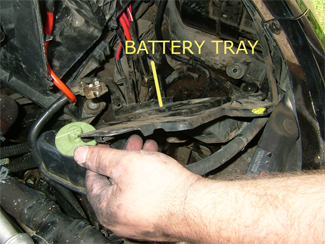 Figure 2-9 shows the cranking battery installed in the Bettle TDI. Install the top engine cover. Start the car and take for a test drive to check for proper operation.